Confidence in the news media is alarmingly low, and it is worth examining something the public considers a high priority: the news from outside Washington, D.C. More and more public policy is being decided at the state level, and it is more common for millions of dollars to be spent in a single state legislative race; but trustworthy sources of information about state capitals are fast disappearing. The alarm started sounding in the 1980s with a steady decline in the number of daily newspapers in the United States. More recently, the survivors of the newspaper shakeout have cut back on local coverage to reduce costs. The Pew Research Center calculated that the number of full-time statehouse reporters at major daily newspapers fell from 467 in 2003 to 303 in 2014. Some newspapers are holding on by the grace of owners with potential conflicts of interest. The largest newspaper in Las Vegas was bought in 2015 by Sheldon Adelson, a casino magnate in a city where the gambling industry dominates both business and government reporting. The Washington Post is owned by Jeff Bezos, chief executive officer of Amazon, the second-largest employer in the United States, which is considering the Washington, D.C., area for a second headquarters. Another disquieting sign: Last month The Charleston Gazette-Mail in West Virginia filed for bankruptcy less than a year after winning a Pulitzer Prize for its coverage of the state’s opioid crisis. Staffers fear that even if The Gazette-Mail can survive with a new owner, it may not be able to continue its vigorous coverage of the coal industry or state government. More and more public policy is being decided at the state level but trustworthy sources of information about state capitals are fast disappearing. 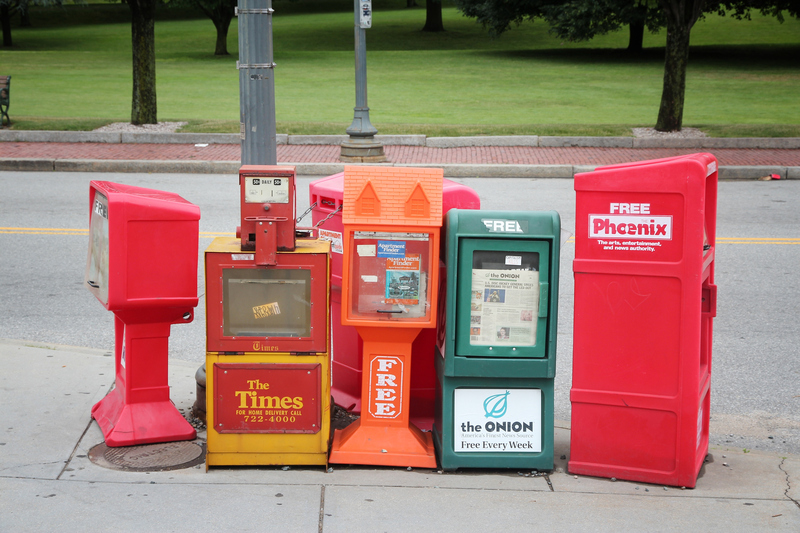 Meanwhile, “alternative weeklies” in New York, Philadelphia, Boston, Los Angeles and other cities have closed or have abandoned investigative journalism. These publications often served as watchdogs over municipal government, holding officials accountable for corruption or inefficiency regardless of party affiliation. As for television, still the most popular source for news, Pew has reported that 86 percent of local stations have no reporter regularly assigned to state government. Coverage is not likely to improve with the consolidation of local affiliates. The Sinclair Broadcast Group, which is seeking to own more than 200 stations, has ordered its outlets to run commentaries on national issues by a former official of the Trump administration; this takes time away from news stories and editorials that address state and local issues. Hope that the digital age could invigorate local journalism, now freed from the costs of newsprint and delivery, has run up against the limitations of a model with little pay for journalists (encouraging them to shift to national media outlets at the first opportunity). Last year, the owner of Gothamist shut down local news sites in five cities after the staff in New York voted to unionize; public radio is trying to revive a few of the sites, but having NPR dominate local news is not an ideal answer to media consolidation. Facebook, stung by criticism that it has become a repository for dubious stories about national politics, recently announced that it will prioritize stories from “local publishers” in users’ feeds and will work with newspapers in about a dozen cities to help them increase their digital subscriptions. These are welcome steps, but they do not address the larger question of how local news outlets can remain financially sustainable as the internet continues to drain advertising revenue. Similarly, the Canadian government has started a fund to support local journalism in smaller communities, but there is debate over whether the fund is big enough to do any good in the long run. A healthy democracy requires oversight and transparency at all levels of government. No matter how one feels about the trustworthiness of the Washington press corps, we should all be concerned about the threats to local journalism and should continue to look for practical ways to preserve it. This article also appeared in print, under the headline "Journalism Is Rotting at the Roots," in the March 19, 2018 issue.